I love fall and I love to cook in the fall...it's not exactly soup weather here in Southern California, but the temperature did dip below 70°, so soup is on the menu! One of my favorites is Butternut Squash Soup. The ingredients are simple and I think it's the Dean & DeLuca Chili Powder Blend that makes all the difference. This time I made home-made croutons to go with the soup. In the freezer I had an assortment of left over bread, including a cranberry bagel. I cut the bread into cubes, drizzled a little olive oil and added some dried herbs and baked in a single layer for about 20 minutes in a 400° oven. A lot of the flavor also comes from slow roasting the squash. I use one large or 2 medium butternut squash and peel, seed and cut into 1 inch dice. I mix it together with course sea salt, freshly ground pepper and olive oil. Place on a baking sheet and bake until tender, turning once. While the squash is baking...Dice one large onion, 2-3 shallots and three cloves of garlic. I use a 7 1/4 quart Le Creuset which is the perfect size for this soup. Saute all the vegetables in olive oil until soft, season with salt and pepper and add 1 tablespoon of chili powder, 1/2 teaspoon oregano, 1/2 teaspoon cumin and 1/2 teaspoon cayenne. Add about a tablespoon of all-purpose flour and stir constantly for a few minutes until it's almost like a paste. Be careful not let it scorch. Then add 1 quart hot vegetable broth. You can use chicken broth, but we prefer vegetable stock in this soup. Add in a tablespoon of tomato paste and simmer for about 30 minutes. While still hot, blend until very smooth with an immersion blender or blend in small batches using a regular blender. If using a regular blender, remove the small inner cap and cover with a clean towel. Right before serving, you can add a little milk. It's delicious without it, so we usually skip it. Two portions over here please! This looks so delicious and we really love soup. The perfect food for the chilly days and even chillier nights which we are now experiencing here in Budapest. The colour is so beautiful too.....the golden glow of autumn in a soup bowl!! That looks very good. I'll have to try that. Great minds thing a like! I'm working on a post that is so similar to this it is ridic! Butternut squash is my absolute fav soup! Looks wonderful, Annie, especially those cranberry croutons. I need to get a le Creuset pot for the season's soups and stews, mine is still in storage! love everything about this recipe annie. love homemade croutons too. so yummy. Hi Annie! This soup looks amazing and I am going to have to try it myself. I love Fall and Fall soupsI I just made a cauliflower one this week that I posted that was soo good! Love the homemade croutonsand all your detailed pictures. 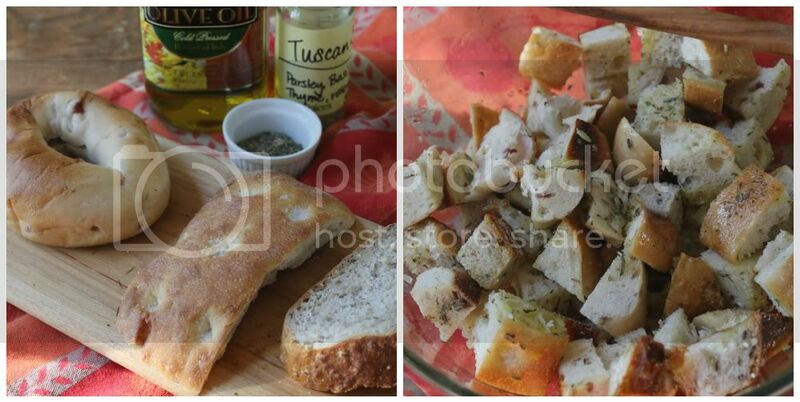 I never think to save my old bread for croutons, I just compost it, now I will save it and make some croutons! Thanks for the tip! I love everything here except the thought of peeling the squash. Not my favorite kitchen chore. YOU ARE THE WINNER OF THE PLEIN AIRE COTTAGE ARTISTS CALENDAR AND A COPY OF THE duPont REGISTRY. That looks wonderful! The temperature also dropped below 70 here in Florida, so I decided it was a soup kind of weekend. I made lentil soup, but I think I need to attempt this butternut squash soup soon! Thank you for sharing! This soup looks amazing! I'm going to give this a try, for sure! I just wanted to say thank you for visiting my blog and for your kind comment. I love soup and this looks delicious, yum! Squash soup is one of my favorites! YUMMY!